We love any chance that the Fenwick Community has to gather together. To that end each year we offer a variety of friendraisers and fundraisers which are open to all! Each year we offer group tickets for a sporting event and a theater event. If you have questions or ideas for an event you would like to see offered, we are always open - let us know! Fundraising events provide a wonderful opportunity for members of the Fenwick community as well as business and community leaders, to support our school by sponsoring, attending, donating items or cash gifts, placing ads, or a combination! In conjunction with the Fenwick Fund, the proceeds from these events support the educational programs, capital improvements and academic enhancements that make a Fenwick education so special. Tickets are in a Promenade Suite and the ticket price includes food and soft drinks. This annual event provides a wonderful gathering of the "Fenwick Family". We appreciate the support of the Fenwick and greater community which helps every student and every program at Bishop Fenwick High School. Additional information will be available later in the year. The 33rd Annual Golf Classic is planned to tee off at the beautiful Ipswich Country Club! We will be registering for the event in the spring. More information to follow! Thank you for your interest but there are no tickets left for Fenwick Night at Wicked. Check back in the Fall to see what the 2018 show will be! Please join us in ringing in 2017 with a swim in Katy's memory! 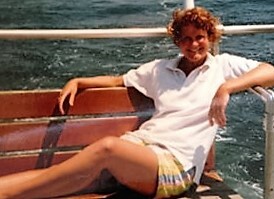 DONATIONS WELCOME to benefit the Katy Warde ’85 Memorial Scholarship Fund. Always willing to offer a helping hand and a listening ear, Katy Warde touched people's lives in so many ways. Her beautiful smile inspired others to appreciate the simple joys in life. Dedicated to service in all that she did, she carried this special spirit with her to the Peace Corps long after leaving Bishop Fenwick. This scholarship is given annually to a young woman, entering her senior year, who demonstrates financial need and exemplifies Katy's spirit and her love of Bishop Fenwick. Your GIFT makes a difference! THANK YOU!